Perhaps the single most desired non-rookie issue from the 1950s. Not the single most expensive, but it's hard to beat Mick's horizontal '56 production; his triple crown year, boasting that million dollar smile backset by an ESPN worthy outfield leep. So cool! Offered here is one the single finest examples of this highly coveted card. A shockingly fresh and well preserved copy boasting stark white borders, fresh edges, and an altegether flawless surface presentation that would only be desribed as 'PSA 10 worthy'. 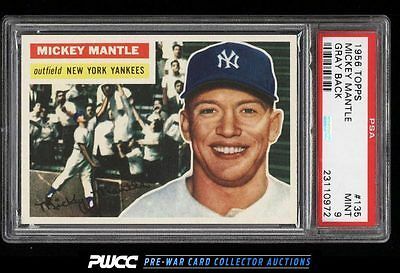 This card pops out of the holder and represents perahps the prettiest 1956 Topps Mantle we've brokered in our time. A world class investment piece that comes with our highest recommendation. One of over 11,000 cards, lots, and sets up for bid in our 9th Auction of 2016. Click on the link above to view the other PWCC auction lots.